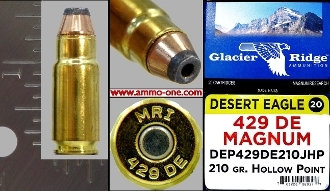 One Cartridge not a box: .429 DE Magnum ( DE = Desert Eagle) produced for Magnum Research with the “Glacier Ridge” name on the box by HSM. New Brass with “MRI 429 DE” Headstamp and loaded with a 210 grain JHP ( Jacketed Hollow Point) projectile. This cartridge was introduce in early 2019 by Magnum Research, it looks to be a copy of the *.440 COR-BON, as wildcat idea by reducing the diameter of the 50 AE cartridge to accept 44 caliber projectiles. * see .440 COR-BON below in related items.